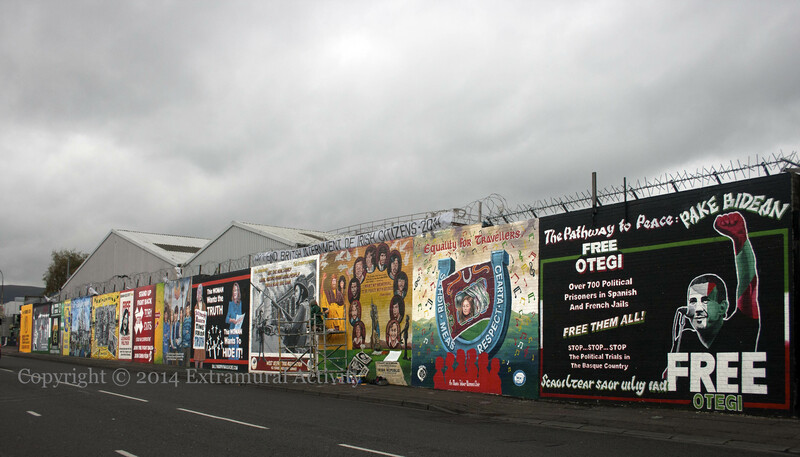 The so-called “International Wall” on Divis Street marks the entry into republican west Belfast. As you travel out from the city centre, you cross the motorway and come to Divis Tower, a block of high-rise flats. 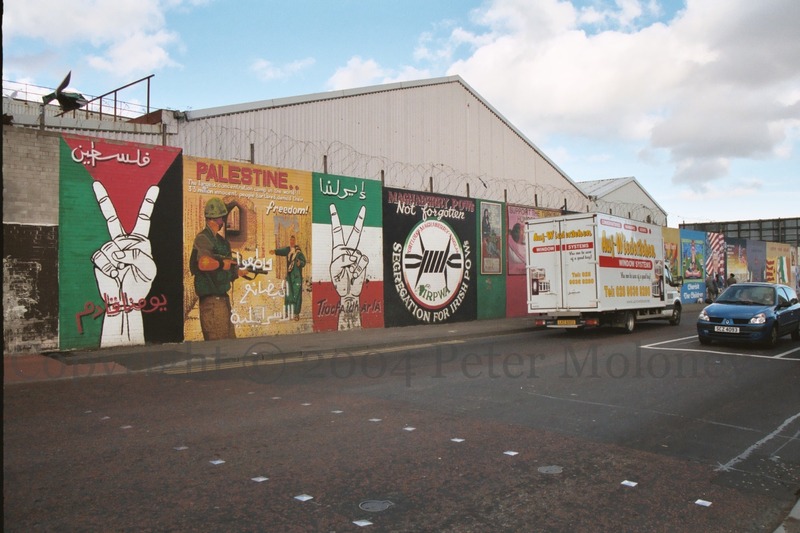 Beginning in 2003, a wall just below Divis Tower was painted with murals and it also serves as a gateway to the area, especially in 2011 when it gained ‘Welcome To West Belfast’ and ‘Coiste Tours’ murals. (There was also for a long time – 1988 to 2000 – a large religious mural on the Morning Star hostel, which seemed to usher one into another world). But shortly above Divis Tower you turn a corner and it is no longer possible to see downtown behind you. You pass between the stately Northern Bank building and the elevated St Comgall’s, and looking ahead into the broadening terrain, you see the mountain in the distance and a wall, about 68 metres (222 feet) in length, covered in murals. When you see the International Wall, you know you have definitely entered a distinctive place, and the wall serves as a manifesto of the community. It’s somewhat surprising then, that having left the supposedly cosmopolitan city centre, the concerns of nationalist west Belfast reach out across the globe. 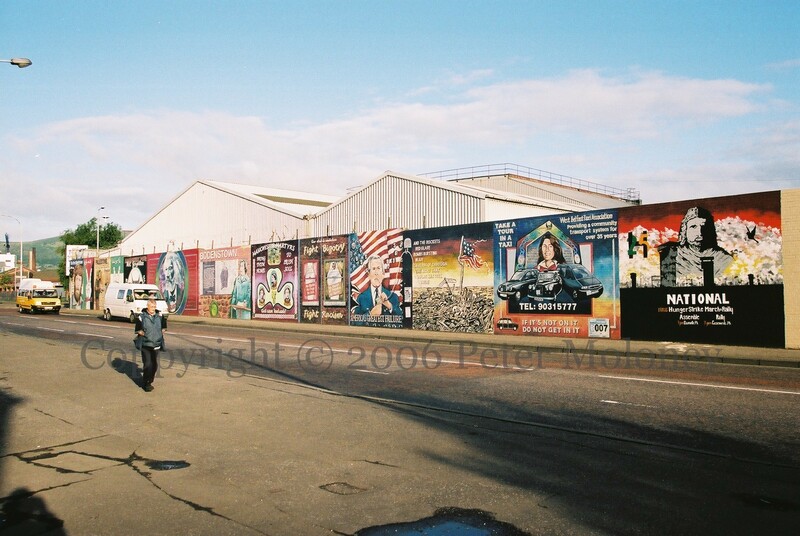 In early days, the wall sometimes sported electoral posters but in general went unused until the year 2000, which is after the Good Friday Agreement. This is perhaps because of the British Army observation post on the top of Divis Tower (it would not be dismantled until late 2005) and because the wall is a perimeter wall of a commercial enterprise (Andrews Flour), which also gave the area something of an industrial feel. At first, it was not “the international wall”. The first mural was a long stencil to victims of plastic bullets, showing in 1:1 scale the distances at which they had been shot. 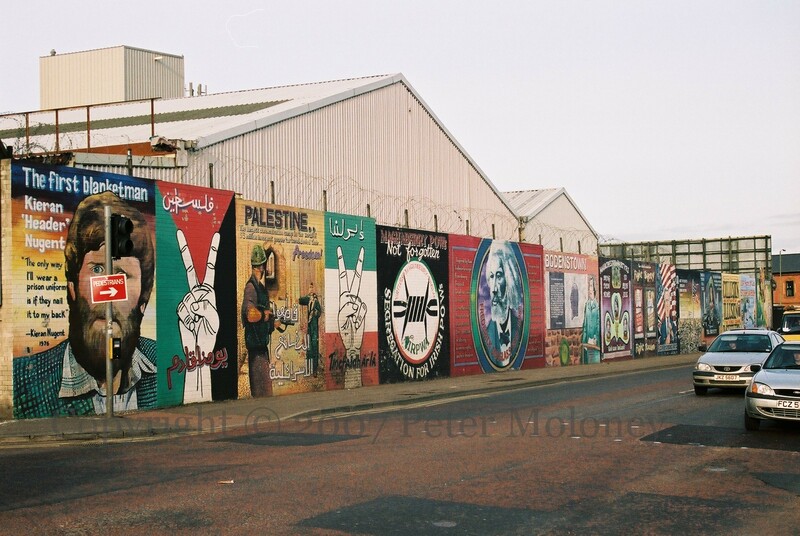 This was gradually replaced with murals and boards, moving from left to right, including, though not exclusively, pieces in support of international causes: by 2002 there were panels about Palestine, Turkish “F-Block” hunger strikers, and imprisoned Native American Leonard Peltier. 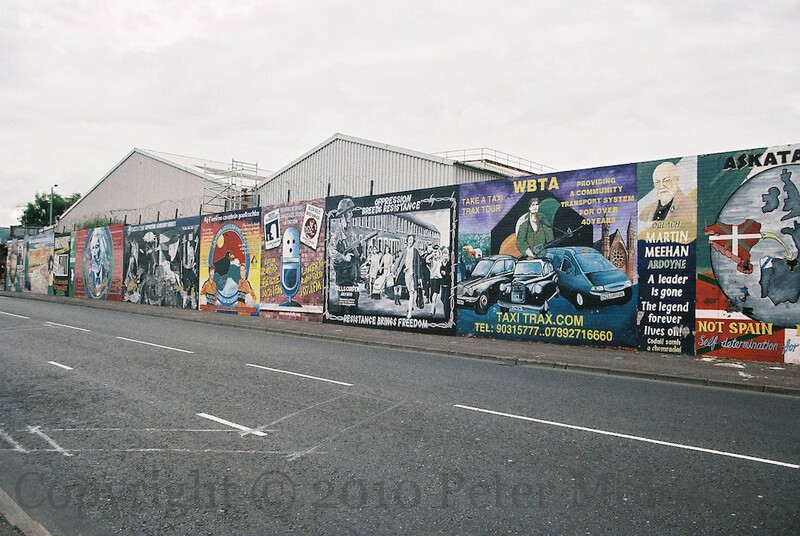 The very first spot on the left-hand side of the wall, which is partly obscured by a traffic signal, was not painted until 2006, when a mural to “the first blanket man” Kieran Nugent was painted. Brendan “The Dark” Hughes, IRA OC in Long Kesh until he and several others went on hunger strike in 1980, was later (2008) added. Since 2006 a mural or board to Nugent (and Hughes) has continuously graced the wall, almost always in this spot. 2006 was also the year in which the wall was completely filled for the first time. The last spot (on the far right) was given a mural to Liam MacCarthy (of the MacCarthy Cup), replacing a small ETA mural, some boards, a stencil, and graffiti, which together did not cover the entire wall. 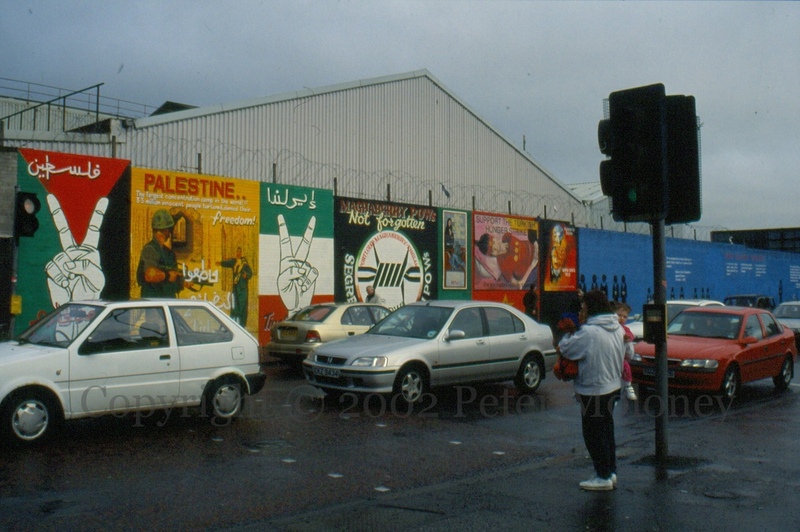 In addition to a Nugent/Hughes mural (in the #1 spot), the wall has almost always had a pro-Palestine mural (immediately following Nugent), a POW or “dissident” mural (immediately follow that), and, starting in 2003, a ‘black taxi’ mural (about two-thirds of the way along, but in various positions). 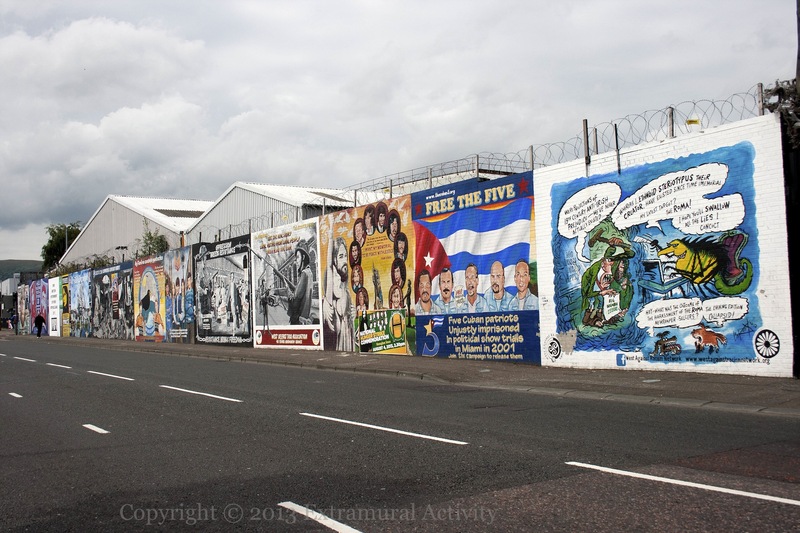 Murals were later also painted on the adjacent wall on Northumberland Street and contains many internationally-themed murals and as such can now be considered just as much a part of the international wall as Divis Street. There is a separate page giving a visual history of Northumberland Street. The wall was filled (up to the first set of security gates, at least) by 2014. For individual histories of each part of the wall, please see the map. 2002 wide shot. About two-thirds of Ban Plastic Bullets remain. With the addition of Nugent, the wall is now full, though the last spot (far right) is something of a mess. It will be cleaned up with the addition of MacCarthy. 2006 wide shot (M02885) Although Iran and MacCarthy on the right are not visible in this shot, the wall is now completely covered in murals. Images, first from the left (X01245), and just below, from the right (X01246). 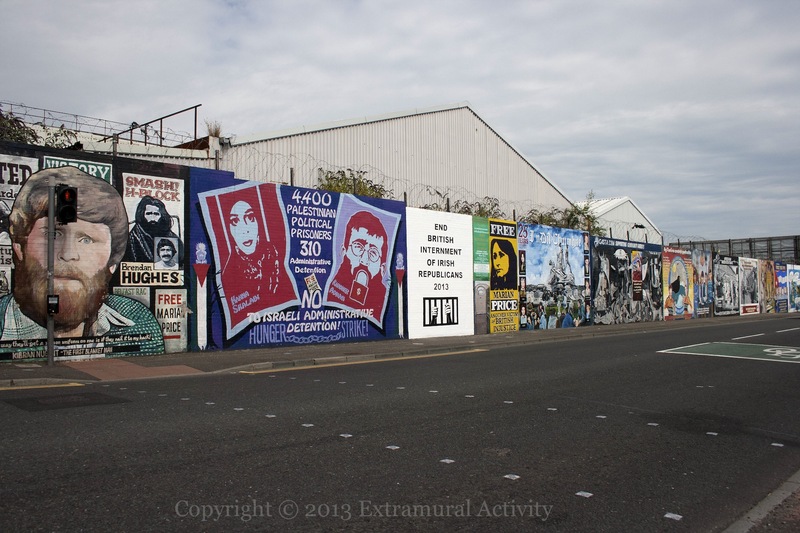 In 2016 the entire wall was repainted for the centenary of the Rising with a long, multi-panel, mural depicting republicanism throughout the centuries, with a focus on connections to Belfast – with the exception of the 32CSM mural in the third spot and a new IRPWA in the final spot. 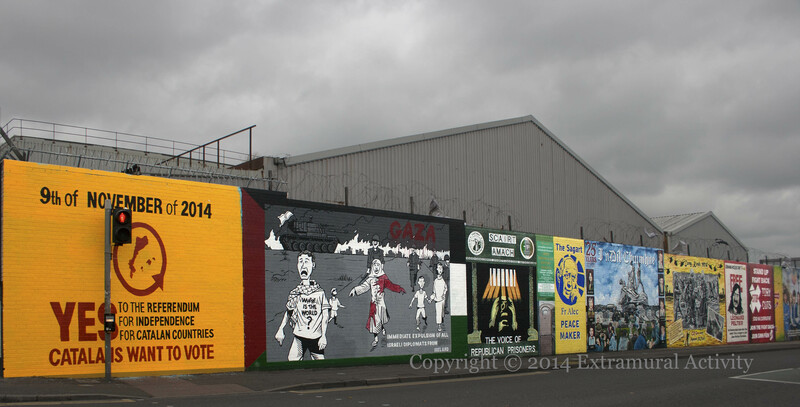 Work began in March; the mural was launched on August 3rd, on the centenary of Casement’s execution. The first piece painted was the Carson/loyalist gunrunning panel, followed by the historical predecessors panel and the MacDiarmada/magic lantern section (also, the Local Volunteers were given vintage uniforms and weapons).